Mrs Willmott a formidable gardener is said to have secretly sown seeds in other peoples garden, an idea that appeals to me as a guerrilla gardener. Growing Eryngiums that look spooky in the moonlight is how they got the name Mrs Willmott’s ghost plants. 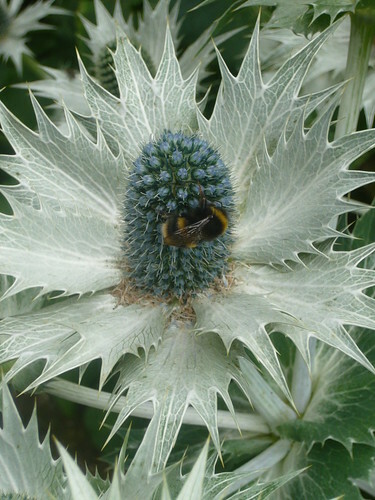 Sea Holly or Eryngium giganteum is an odd looking perennial with prickly, silvery-grey bracts under steel-blue cones. Wonderful for dried arrangements, especially at Christmas. An architectural plant that attracts wildlife to feed or nest. Suitable for container growing; – ideal as a ‘stand out’ plant. Surface sow and just cover with vermiculite. Do not exclude light. Germination can be slow. Sow in February to get a bit of frost or place in a refrigerator (not freezer) for 3-6 weeks. Prefers a rich, light, well drained soil. Honesty seed heads look a bit ghostly once the seeds have gone and the coin shaped, white paper disc is left to reflect low winter light. If you want a ‘ghost of Christmas past’ combine these two in a dry flower arrangement.